Have you ever been on a walking safari or do you prefer the comfort of a nice car taking you around the parks? I can just give you the advice: if you have the chance, do a safari by foot and “off the beaten tracks.” It’s worth it! Hyena footprints can easily be identified because of the claws always visible. Some mornings in the Mara start very early at 6am. Without breakfast, we try to get out of the tent before the sun decides to open the new day officially. We have to hurry to be in the bush before the cattle come back from nights grazing. The river is just 100m from the tent and leads us on our way. We keep our eyes and ears open for any signs of wildlife. 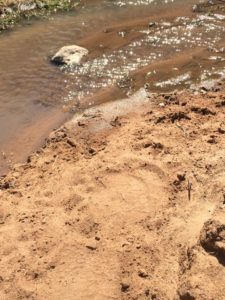 Right at the place that some Maasai use for bathing, we find fresh elephant footprints. They are probably just one hour old, because you can still see the patterns of the feet, which resemble our own fingerprints. With the windy conditions this morning, those “lines” will vanish soon. Now we are alert and watch the surroundings even more carefully: you don’t want to accidentally bump into the big greys. We find more evidence of them roaming around this area last night: fresh elephant dung and many many broken branches of trees and bushes. But elephants are not the only animals who left their tracks. The buffalo was here as well. Suddenly we hear something and see some movement behind the trees. 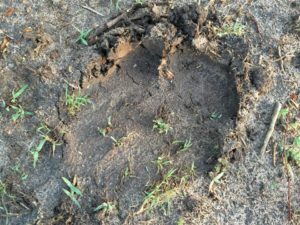 Elephant footprints resemble human finger prints – each is unique. An oxpecker flies up hastily, screaming and alerting his best friend – the buffalo. Now we definitely have proof of their close presence, because those two animals live the perfect friendship: The oxpecker pick the ticks and flies from the big mammals and as an exchange for the nice “full board” they play the buffalos warning system. For us that’s reason enough to change the direction away from these dangerous two of the Big 5. We proceed on the other side of the small river. Even here we are lucky. 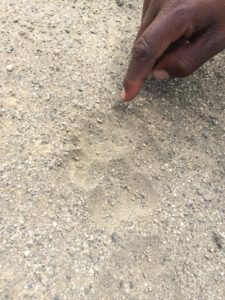 After a while we find the fresh footprints of giraffes, that are nearly as big as my palm. For me, the giraffe is the most elegant moving animal in the world. We even spot proof of rhino, which is the rarest animal to see in the Mara. It was not far away from our camp. What a really amazing feeling. We proceed through the thick bush and run directly into a dikdik toilet. With these small droppings the smallest antelope (the size of a middle-sized dog) mark their territory. Dikdiks always live together in pairs but this time we actually see three of them. Proud parents with a calf. With around 50m between the family and us they seem to be comfortable and continue searching the surroundings for food. We watch them for a few minutes and go on with our bush walk. Suddenly we are stopped by some brownish animals crossing the paths in front of us. A bachelor herd of impalas are jumping out of the bush to run for the small waterhole on the other side of the path. Around twenty young bulls are in the group. Males are easily to distinguish from females, because they are the only one proudly displaying horns. But those guys are shy and vanish fast into the bush. A Walking Safari is an unique experience! This morning we didn’t manage to see the giraffes that left their footprints in the soil, but in the afternoon we went for a ride with the motorbike. There we found a large group of Maasai Giraffe along a not very frequented road – probably the same giraffe from this morning. It’s amazing to see them walking past you when you are not sitting up high in a car, because now at ground level you really get a feeling for their great size. What an awesome day in the Maasai Mara. All in all you are probably not that lucky to “see the signs” of the plentiful animal wildlife living here when using a car, but every animal you spot on foot will be a great treasure. Even if its “just” a wildebeest (and you would not stop for it after you have seen a few of them while driving) finding them while walking in the African bush is an awesome experience and you get to know more about the whole nature! With Namayiana Safaris we can organize a Walking Safari like this just for you. Just contact us! 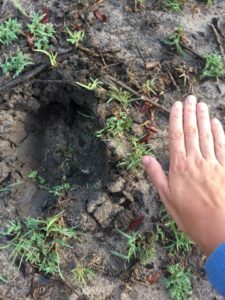 This entry was posted in Animals, What to Do, Wildlife and tagged Adventure, buffalo, Elephant, experience, hike, nature, Safari, tracking, tracks, walking. Bookmark the permalink.